I have some unpainted Stumpy blanks. 3 are pure white, and glued ( or sonic welded?? ) together with tow point and hangers. The other one is a different yellow material and not glued so you can pull it apart and see inside. Can anyone tell me about the 2 materials and Lively Lures' involvement in the moulding? cant tell you much Jim but lively lures Alan and Paul Dolan did a lot of moulding for other luremakers under contract back in the 80's and 90's and i think they even do some occasionally now.the material of the top lure appears to be polurethane a two part material which i believe(please forgive me if i'm wrong Allan!) was made by injecting the material by way of a mixing gun into a mold ,i heard they could make a hell of a lot of lures very fast this way(i do know more but cant say). 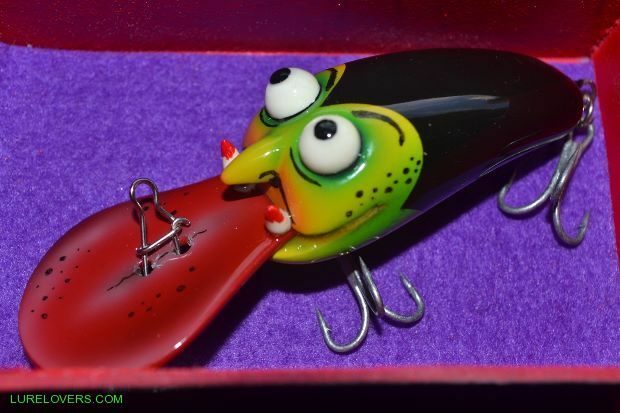 Pretty certain all lively lures are molded as one piece with the bib n eyelets place in the mold prior to injection of polyurethane. Hi Luc, your spot on that's exactly how Allan does it at Lively.